(Clearwisdom.net) On October 26, a rally was held in Richmond to raise awareness about the human rights violations in China. Elected officials and local rights activists attended the rally to condemn the Chinese Communist Party (CCP) for continuing its persecution against the Chinese people before the 2008 Olympics. 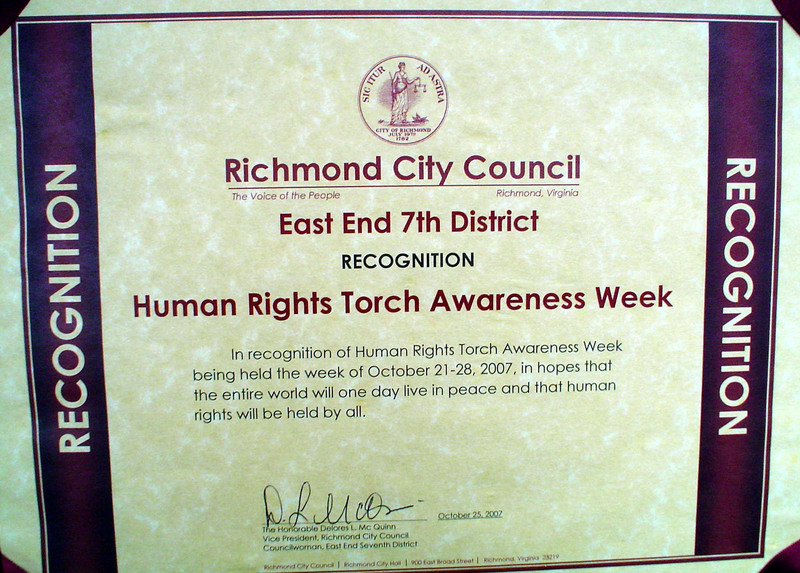 The Richmond City Council for the 7th District proclaimed the week as "Human Rights Torch Awareness Week." 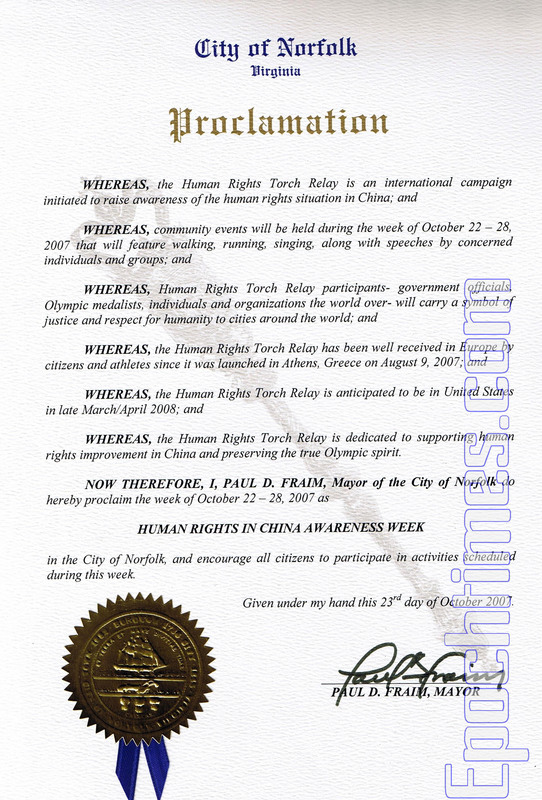 The mayor of Norfolk issued a proclamation in honor of the Human Rights Torch Relay. Steve Cambisios: "We are capable of stopping persecutions around the world"
At noontime on October 26, Richmond City Council members, community leaders, school teachers, and students rallied outside the Richmond City Council chambers. 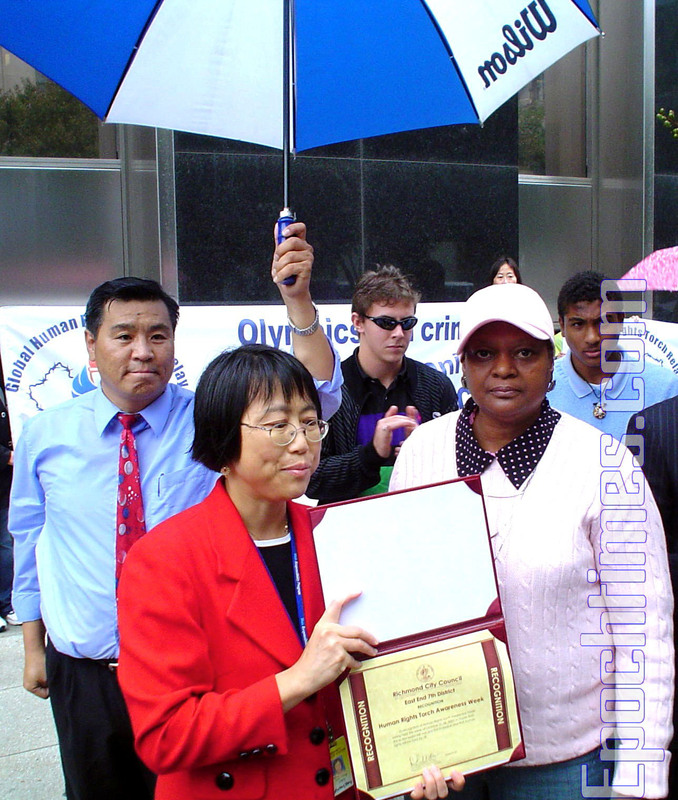 City Council member Ms. McQuinn issued a proclamation to the Human Rights Torch Relay and the Coalition to Investigate the Persecution of Falun Gong (CIPFG), proclaiming the week of October 21-28 as Human Rights Torch Awareness Week. The City of Norfolk also issued a proclamation for the Human Rights Torch Relay. At the rally, Ms. McQuinn said that human rights violations in China are a global issue, and everyone should stand up against torture. She said that she would take every opportunity to let people know about the persecution in China. Dr. Yuwei Zhang is a research scientist of the National Health Institute. 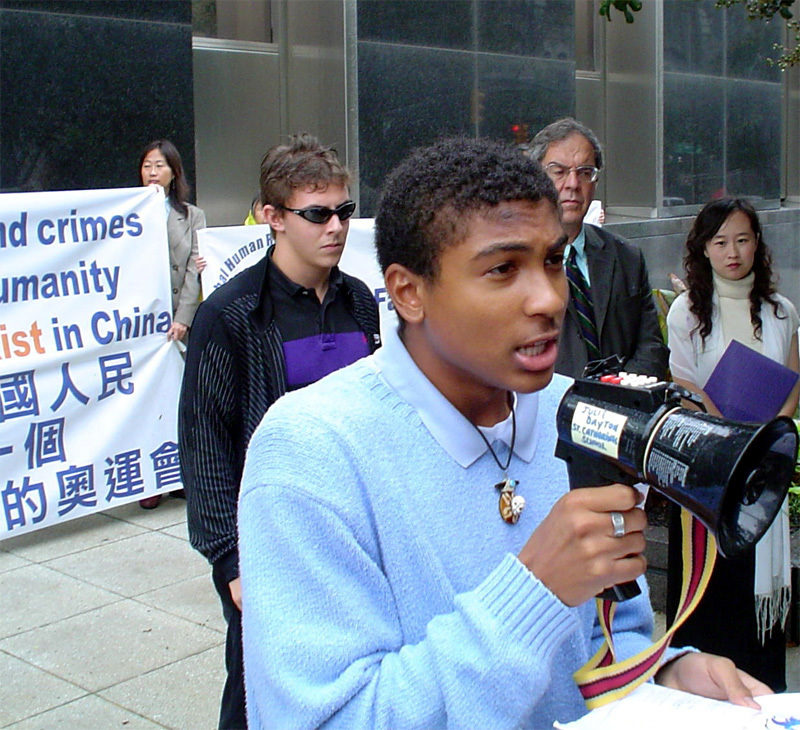 He recounted his experiences in China, where he was brutally tortured for his belief in Falun Gong. Mr. Chengzhong Zhang, a representative from the Richmond Vietnamese community, said that he was well aware of the cruelty of the communist regime. He said, "Several years ago, the CCP pledged to improve human rights in China when it was applying to host the Olympic Games. However, it never fulfilled its pledge. As 2008 approaches, its human rights violations continue to escalate. It has arrested many human rights lawyers and journalists and arrested numerous Falun Gong practitioners, who are then subjectied to organ harvesting." Zhang said, "We wholeheartedly support the Human Rights Torch Relay. We cannot permit a repeat of the Berlin Olympics." Economist Steve Cambisios said, "We live on the same planet and we are members of the international community. We are capable of stopping persecution around the world." Led by their teacher, Lanlan Wang, students from two high schools sang the theme song of the Human Rights Relay Torch, praying for freedom, peace and justice in China and around the world. Representing the students, 11th grader Keanan Thompson spoke out at the rally to express their support of the torch relay. When interviewed, several students said, "People around the world should enjoy basic human rights and freedom. Chinese people, however, have been deprived of their human rights. Though it is happening in China and is far from us, it could soon happen here if we don't take action now. Therefore, as soon as such violations happen, we need to stop them." Ariel Forest is the western Virginia contact for the Human Rights Torch Relay. He said, "The mission of the Human Rights Torch Relay is to end the CCP's persecution of Chinese people, especially Falun Gong practitioners. To date, more than 100 cities in 35 countries have joined this project. Since the torch was lit in Athens on August 8, it has visited more than 20 countries and it is currently in Australia. After a two-month tour, it comes to North America. Richmond City Council Member McQuinn said that Richmond will welcome the Torch when it visits the city next March. "I know Richmond. The people will wholeheartedly support it," the councilwoman said.